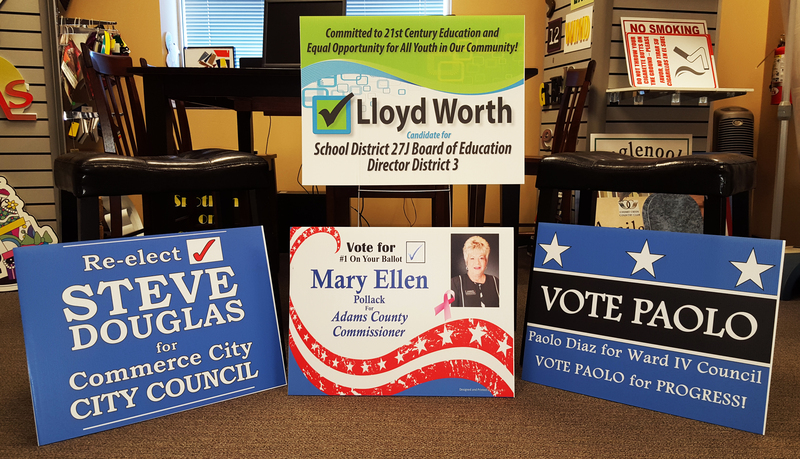 With the political season well under way and what is sure to be an interesting Presidential election ahead of us, trade magazine Signweb recently wrote an article highlighting shops around the country that have provided signage for political candidates. With a long history of working with political candidates, Signarama is excited to have been included on this list! Being a swing state, Colorado is used to close elections. And with close elections and a highly competitive political field comes the importance of cost efficient and eye catching signage. During the busiest weeks of election season, we spend more than eight hours a day printing political signage, which makes our flatbed printer a great tool for the job. Our latex-ink printer is used as well, efficiently producing name badges, banners and magnetic vehicle signage for campaigns. The most important part of working with politicians is keeping lines of communication open. With jobs to work and a campaign to tackle, political candidates can be tough to get ahold of, which is why we rely on email messages to ensure the upmost efficiency. We also recommend only working with one representative, preventing the confusion and potential miscommunication that can occur when discussing signage with an entire committee. To read the Signweb article, click here. Interested in learning how Signarama can help with your next project or campaign? Contact us at 303-914-9700 or visit our Brighton, Colorado shop at 1289 S. 4th Ave, Unit 200.